I see my friend Deb Maxwell at Not Very Fancy in 1st is doing a cooking link-up. Yum. 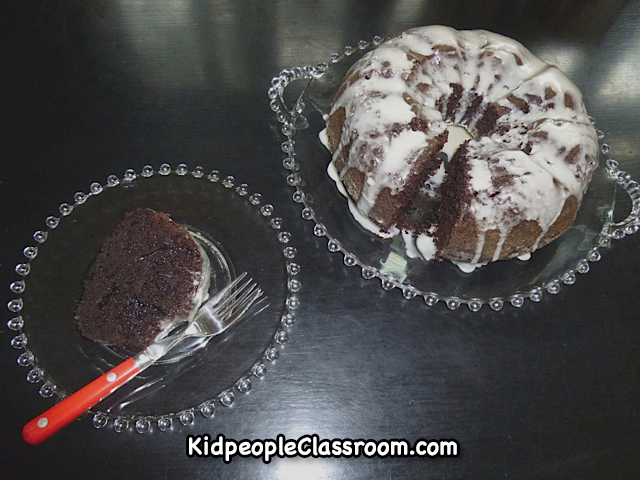 Some of the recipes that have been posted on the link are really good, so I'm going to be a teacher in the kitchen and share a family favorite, too. Today's share is Died-and-Went-to-Heaven Chocolate Cake... hmmm... I wonder just HOW MANY cakes are called Died and Went to Heaven... Well, that really was it's name when I first got the recipe long ago. There are many good things about this cake, in addition to it being chocolate, of course. It is easy to make in a bundt pan with no frosting to spread– just pour on a glaze. It is super moist every time thanks to buttermilk. It tastes rich, maybe because of a little bit of coffee, but it is only 220 calories and 5 grams of fat per serving. You can serve 16 with one cake... well, sometimes, for some reason, we don't get quite sixteen pieces. Now, for the cheat part of this post. The recipe is already on my blog! It is under the "Other Stuff" tab. I have a few new readers since I first posted the recipe, so in case some of you are not blog stalkers who check out every little tab on a site, I give a little heads up to find it. Just click on the picture below and you'll magically find the directions. On fourth of July I put little blueberries and strawberries around the plate edge and they go really well with this cake. I have also been known to fill the bundt cake hole with fruit or whipping cream, too... oops. Click on Deb's icon below to go back to her Linky. Have a great week! Hope you'll stop by again for a little back-to-school series I'm posting this week featuring activities and routines to get the year off to a great start. See you around. Thanks for linking up, Kathleen! That looks delicious. Question about the buttermilk: I read one time that you can substitute milk with a little vinegar for buttermilk. Have you ever tried that? I've done it; it seemed ok, but I didn't have anything to compare it to.